I have a very old doll crib that my girls played with when they were little, it´s been sitting in the garage for years gathering dust, but now it´s time to be played with once again. I am gifting it to my granddaughter, who is almost 2. Once the crib was painted, I made the mattress, just some polyester wadding, and a basic slipcover, made the pillow, and then the quilt. Crazy as it sounds, this little quilt was the one I most loved making to date, it was probably because I wasn´t stressing about perfect seams etc, I used old scraps of fabric, I even had a giggle while basting, what a pleasure to stand and baste this little cutie, and not have to crawl around the floor like usual. If you´re wondering what the spoon is for, I use it to help close the safety pins, I saw this on a youtube video once, and it´s a great tip. The quilting is a simple wavy lines along the seams. Everything just lined up perfectly, and it´s all just so cute! What a fun project this has been! Initially, I bought a roll of Heather Bailey – Nicey Jane collection, but then I had to buy another roll to finish the quilt, but I still have loads of strips left over to make matching cushions or whatever, I haven’t decided it. The backing is a plain cotton bed sheet. I needed to cut down on the cost of fabric and the work in having to piece the fabric to the size of the quilt top, so a sheet was the answer for me, bought a king size sheet and trimmed it to size. The binding is a lime colored Kona solid. The quilting is straight lines on the white background, I didn’t quilt the jelly roll strips, because I want it to pop out a bit. I´m quite pleased with how it turned out, the colors are bright and airy, and will make for a happy room. Thanks for the visit, Have a bright happy day. This weekend I sewed up 3 pencil pouches, but one I gifted away so quickly that I forgot to take a photo 🙂 I gave it to my daughter who started a new job. The other I made, just because I wanted to use up scraps, I still have left over from my granddaughter´s backpack. Since she´s only 22 months old, I´ll keep it until she goes to school, which won´t be for a while Haha. 🙂 Actually, it´s a nice pouch to carry a fabric rotary cutter, scissors etc. Thanks for the visit, have a lovely day! 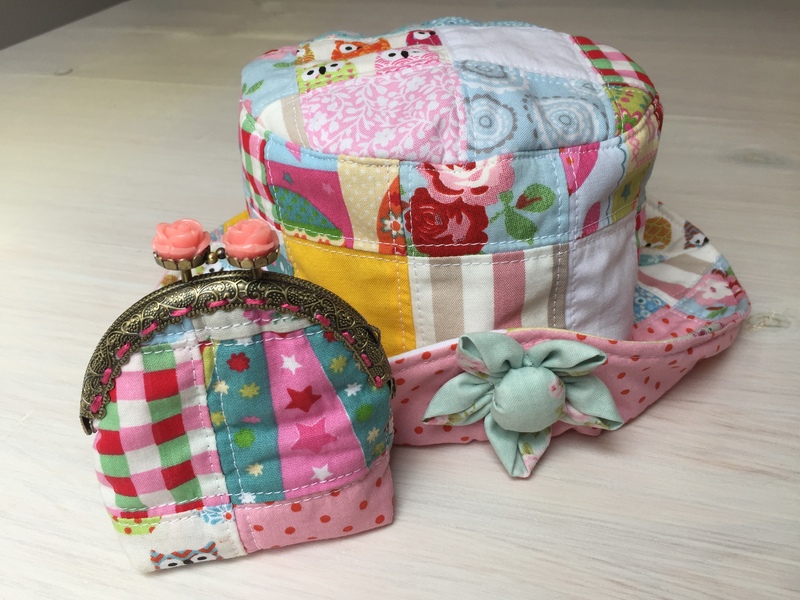 In my last post I mentioned that I would be making a purse to match Isabella´s Hat Here and satchel, Here and here it is! 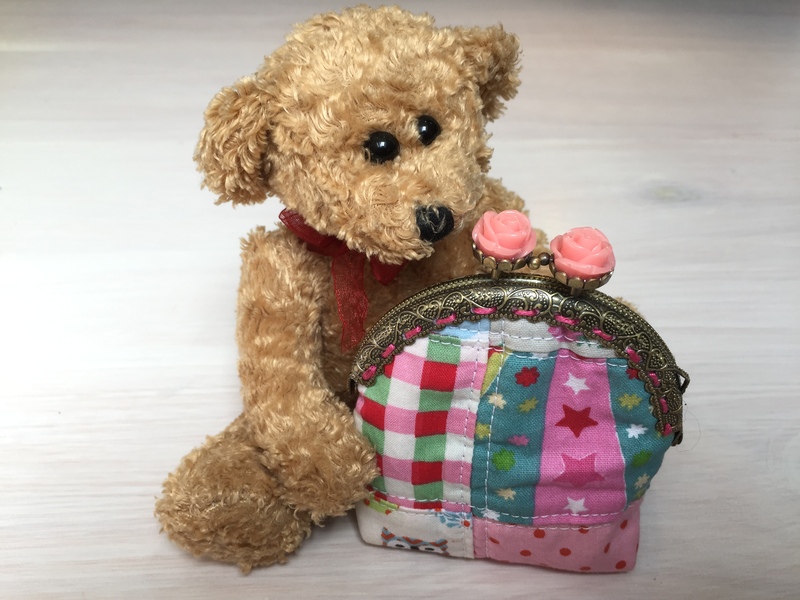 It really was great fun to make, basically just cut the fabric to the size you want, sew it up as you would for any bag, and glue the top of the fabric to the metal closure. This closure has openings on the bottom rim, so I sewed pink embroidery floss through it to give it a little finishing touch. Thanks for the visit, have a great day! 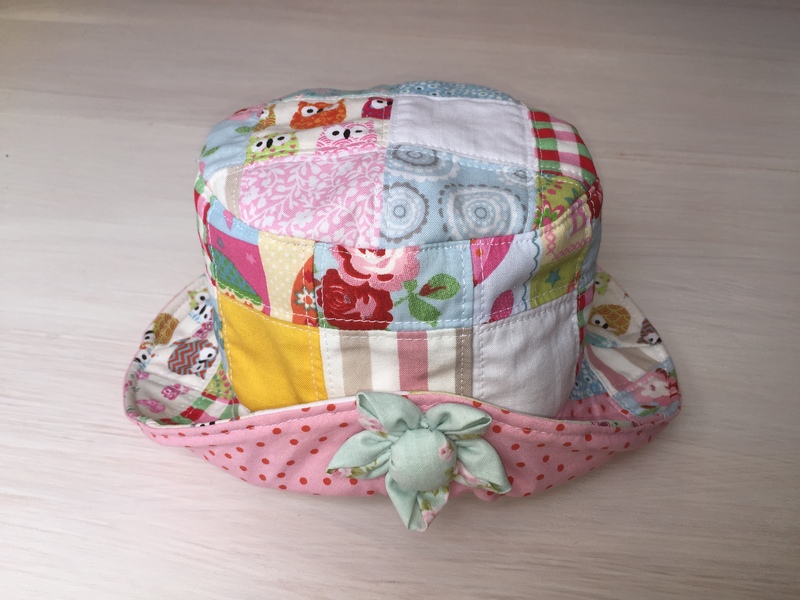 In anticipation that sometime this year we will actually have a summer, I made a hat for Isabella! I really love the way it turned out, I think it´s super cute! Next up, I´m making a little matching purse, I´ve never done one before, so looking forward to that. Wishing you all a great sunny weakend! Apparently, nowadays children are getting a whole lot of homework at a very early age. Ever since my 10 month old granddaughter started nursery school 2 months ago, she has been given homework to do, and because she really doesn’t like doing homework, her mum and dad have had to do it! Well last week, she was told she had to make a fabric block with Love as the theme, so I was roped in to do my bit, actually I was thrilled, I have been wanting to try applique for ages but hadn´t had a clear idea of what I wanted to do, so here was my chance. We chose to make an elephant with hearts, so printed an elephant from clip art and I made the block. Ok, it´s not perfect, I still need loads of practice on my appliqueing skills 🙂 but I loved making it, so it was a well named theme, the Love theme! For most of the fabric I used scraps left over from the quilt I made for her cot Here and also bought a strip of owl print fabric, I just love owls! Well here you have it, all finished and ready for Miss Muffet to use. Having finished the nursing pillow, I had some fabric left over, so I decided to make a pouch, which is very quick and easy to make. These pouches are useful for a whole bunch of things, especially when you have to leave the house with baby, we generally use them to keep a change of clothes for baby. 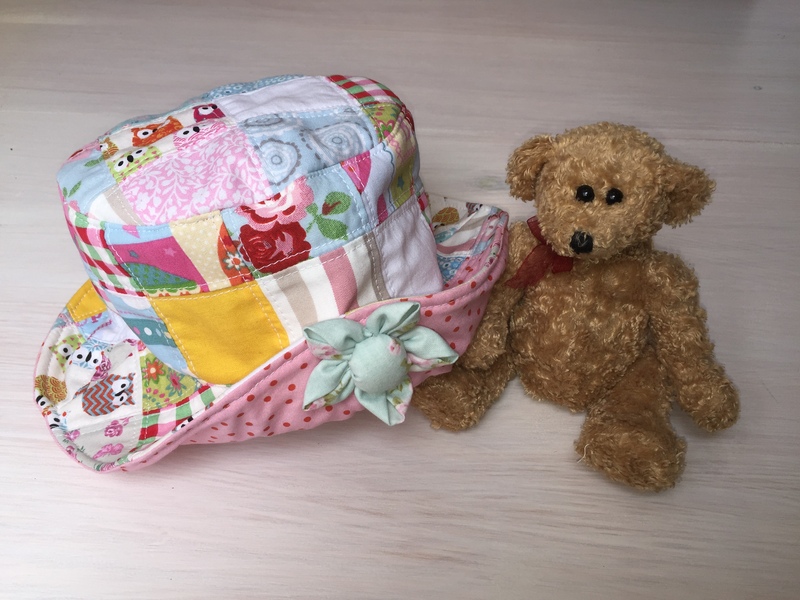 They can also be useful when the little tots start nursery school, then you can just sew on some straps to the back of the pouch or a handle to the top, and they can wear them as a back pack or bag to take an extra set of clothes to school or whatever. After you have cut 2 parts of the outer fabric and 2 parts of the lining, (Lining and outside fabric are the same size), and cut 2 parts for the flap . Attach interfacing to both sides of the outer fabric, and to one side of the flap. Right sides facing each other, sew around the edges of the outer part, the lining and the flap, leaving the top parts unsewn. In the lining leave about 6cm unsewn on the side, this gap is where the pouch will be turned inside out once it´s finished. To give the pouch some depth make box corners, on both the outer part, and the lining. To do this fold the corners into a triangle, measure about 3cm from the outer edge in the center, mark with a ruler and stitch along the line. If you look carefully you will notice that I forgot to leave a gap open on the side of the lining, but no worries, if the same happens to you, just unpick some stitches. Cut off the triangle bits, but before cutting them off, turn the bags inside out to make sure that the corner seams are aligned, if they aren’t, just unpick and redo. The first photo below shows my seams, not perfect but good enough. Now the Flap ….turn the flap inside out and fold in the corners so they become diagonal. Next pin the flap to one side of the outer part. Then with the right side of the lining facing the right side of the outer fabric, slide outer part including the flap inside the lining. Pin around the top and sew all the way around, 1cm from the edge. Trim off the excess bits on top and turn everything inside out through the gap on the side of the lining. Top stitch around the edges of the flap so that it looks neater, and add some snap studs. Oh… and don’t forget to sew the gap in the lining closed. Here is a photo of another one I made, but here I chose a different fabric for the flap, and the pouch is slightly smaller. Recently I made 2 nursing pillows, one for my daughter, and then for a friend of hers, that´s also pregnant. These nursing pillows are really very comfortable for mother and baby and quite easy to make. The measurements of the pattern are basically what you see in the diagram below. Fold the fabric, so that the straight edge of the pattern A is on the fold, cut the fabric allowing for 1 cm seams. Cut a second piece on the fold again. Do a quick zig zag around the edges to strengthen the fabric, especially as we will be snipping around the edges later. Then sew both pieces together except for the curved inner part, also leave a +- 9 cm opening on the top so that you can stuff the pillow later on. I´ve placed scissors where you´re not supposed to sew, so that you get a better idea of what I mean. To make the slip cover, cut one piece on the fold, this will be the front part. For the back part of the slip cover, you have to make allowance for the zip. So fold part A (see first diagram) approximately 10 cm then cut the fabric on a straight line but leave an additional 2.5 cm to attach the zip. and cut the rest of the fabric following the lines of the front part of the slip cover. Below in the photo, The part for the front of the slip cover is being used as a pattern for the back. Next, attach the zip to the back of the slip cover. Place zip along the edge of top part and measure from the edges to sew the fabric strips to the ends of the zip. then cut off the excess zip edges. Iron and top sitch along the edges . Then sew both parts together right sides facing each other, but do not sew the curved part. As you can see in the image I also sewed a quick zig zag around the whole outer edges to strengthen the fabric. Now for the tricky part…. Measure around the inner part of the cushion covers, then cut a strip of fabric approximately the same size, mine was +- 64cm (always make the strip a bit longer than what you measured, to allow for the curvature). Fold it in half and cut it so that it tapers from 7cm in the center to 3 cm at the end, these measurements include the seams allowance, your final strip will be approximately 6 cm to 1cm. Pin and attach to the curved part of the covers. Then snip around the seams of both covers, so that when the cushion is filled, it allows the outer edges of the fabric to slightly fan out. Turn the cushion cover inside out through the little hole that was left on top and fill it. I use cotton stuffing fiber, about 1.5 kg until it is really taught. then just hand sew the opening on top. All done, just slip on the cover slip and Voila, you have a nursing pillow!